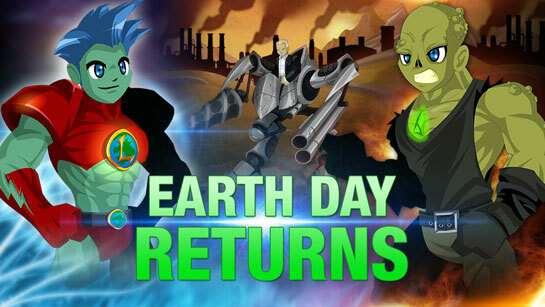 Be a hero, join the clean-up crew to save the world from the evils of pollution! 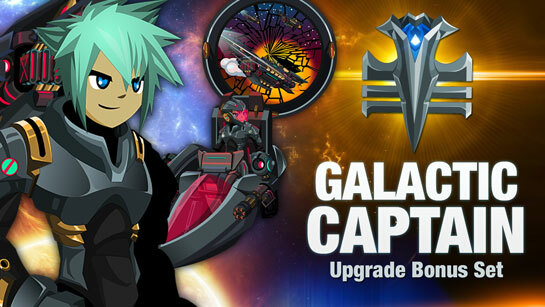 Captain Lore is back and he needs your help again! /Join pollution to help Captain Lore battle General Pollution, the foulest villain around, free his eco-friendly energy platform from the chaotic clutches of General Pollution! Reduce, reuse, and recycle as many elementals as you can to unlock Captain Lore's shop and gain access to the greenest gear in the game! New for 2019: General Pollution’s evil knows no bounds. He has moved beyond polluting our world and is now using a new ally to pour his filthy lies into the minds of the good people of Lore. His scientists have created Commodore Core… a super-villain leading the push for deep-lore drilling straight into the heart of Lore’s core under the guise of finding newer, cleaner sources of energy. Last year's Cutsey GrenwogSlayer is BACK in the Featured Gear Shop in your game menu, and is joined by the Lightning Mage armor set. Channel the power of nature as you defeat the villains trying to destroy it! 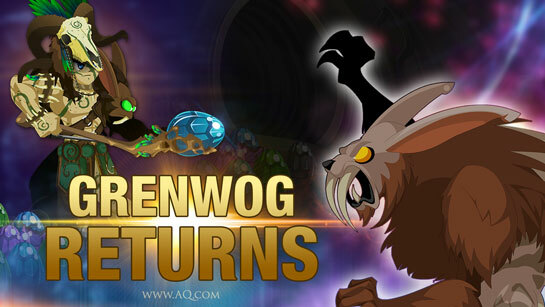 Our Seasonal Spring Event Returns: Grenwog is back! Every year, heroes hunt around Battleon for eggs and prizes, and battle the deadly, egg-sucking Grenwog as we celebrate the return of Spring! 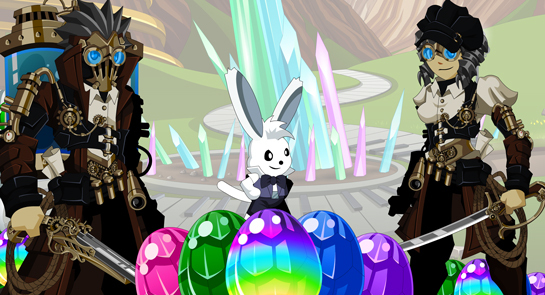 This weekend talk to Cabdury (the friendliest, most inedible bunny in town) to begin this year's Egg Hunt quests in Battleon. 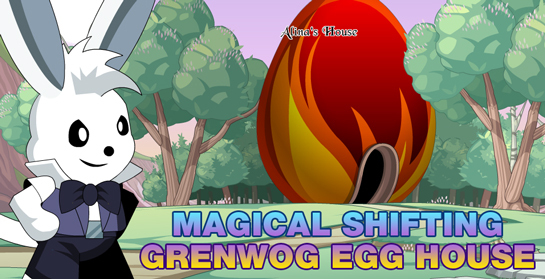 After whetting your detection skills in BattleOn, TRUE eggsplorers can talk to Cabdury and decipher his clues to find the pink, green, blue, purple, or multicolored eggs hidden around the rest of Lore to unlock all-new rewards: the Steampunk Eggsplorer set! Once you've collected all those, why not try Cabdury's Treat Hunt to unlock the Evolved Berserker Bunny set? The merge items will drop from the bosses in Greenguard Forest. With an Armor, a Helm, a Spear, and a Long-sword, you'll have a bun-tiful amount of items to choose from! 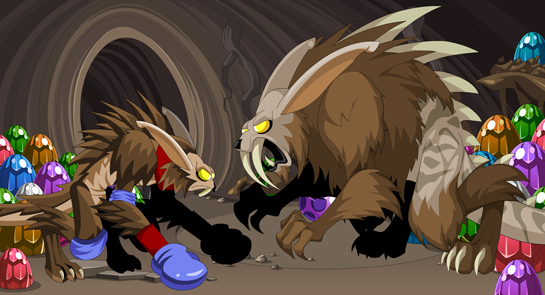 The Evolved Berserker Bunny Armor also requires the drop from the final Vorpal Bunny quest. The legendary Grenwog is one of the fiercest beasts on Lore. Each spring, it awakens with one thing on its mind -- FOOD. And its favorite snack is, of course, eggs! (And the heroes who try to steal them. So beware!) Last year's Jurassic Grenwog adventure will return, along with the seasonal boss battle in the /grenwog map! The Eerie Underworld General variant from AQW Community Artist is now available! If you have the Dark Caster Collection Set from Dage's birthday event, you will find all the set pieces in your collection shop. If you bought the Underworld General armor from Dage's Birthday shop, you can find a shop with the 0 AC set pieces in the Curio Shop in Battleontown. Last month, Dage vowed to craft an exclusive weapon for he loyal members of his Undead Legion. The Blade of the Loyal Legion Warrior is available for 1,000 Legion tokens from the Undead Legion Merge Shop and gives a 20% boost to gold. It's a pricey weapon, but shows that only the most loyal and dedicated legionnaires will possess it. A new quest has been added to the Legion Castle house (available from Undead Legion Merge Shop for 25,000 Legion Tokens and 15 Shadow Shrouds). Beat the Heat, It's Party Time! 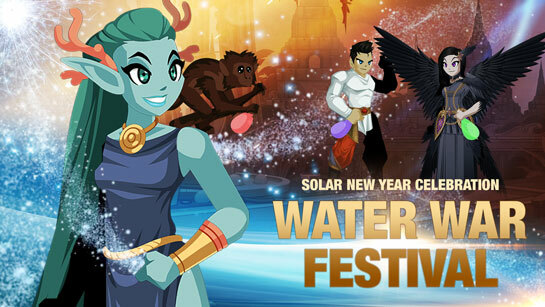 Celebrate the Solar New Year in BloodTusk with a WATER WAR! Log in this week and get ready for a FLOOD of hot new gear as we celebrate the Solar New Year in Bloodtusk Ravine with the Water War Festival! This weekend's update is inspired by the real-life Songkran Festival in Thailand and other countries, where they wipe the old year clean... with water guns and balloons! This week's event was inspired by AQ3D and AQWorlds artist, Darkon. We loved his designs and wanted to weave them into the existing world of Lore. Talk to Aquella the Water Elf (who many of you long-time AE heroes will recognize from AdventureQuest and DragonFable), Keeper of the Water Guns. She'll guide you through the festival... but there is only one REAL goal -- to have fun and get SOAKED! Find her Water War Merge Shop featuring gear from Darkon and Crulon, then fight the Temple Gibbons to get 0 AC battlepets and regular pets. Raise the War Meter to 100% to unlock the War Boss and even more rewards! On Monday, we launched the April Fool's in-game event -- a war of PUNTASTIC proportions. You can find the rare war drops and shops in-game until at least April 15th. The war map and the Nekomancer armor set will be permanent additions, so if you don't have time to farm the gear, never fear! Battle any of the monsters in the event map to get Punadin Badges to use in the war merge shop. * Shoutout to K0rey, AQW Streamer and player, who theorized that this YARRR's event would be pirate-themed. So, SO close! ** The most appropriate time to release this armor was always going to be April Fools. The idea quacked the dev team up! We have a ton of combat-heavy updates heading your way this month - we're starting the Queen of Monsters' Finale Saga with the 2-week War of Shadows. There's going to be darkness, death, pain, and a few new allies. That's why the team wanted this year's April Fool's update to be light-hearted and a throwback to the humor of the earliest days. * There are 10 kinds of enemies in the world: those who understand binary, and those who don't. 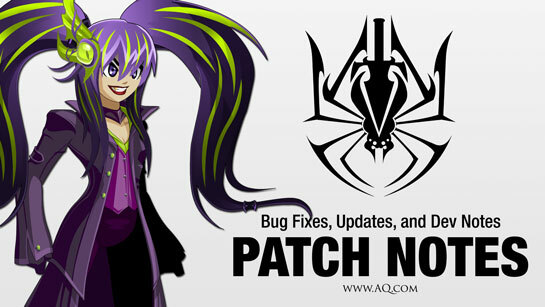 The combat engine and the AQWorlds servers have not REALLY been infected, hacked, or put at risk... unless you think puns are the most dangerous form of humor. Crashes! We all hate them! But what you may not realize is not all crashes are server or game crashes. Today, we will talk about the difference between server/game and client crashing. A server/game crash is exactly what it implies, the entire server or game is down and none of the players can reach it. The causes of server and game crashes are varied, so we can’t actually say with any certainty at any point that “crash A was caused by reason X” until we are done investigating each crash. Rest assured that we do not want the game down any more than you do. When the server actually crashes we work as hard and as fast as possible to get things back up so you can return to your play time. A client crash is when something happens that disconnects you from the server, but the game itself was not affected. This is what happens most of the time when we see reports of “game crashed”. There are quite a few known causes for why this happens. Unfortunately, we cannot troubleshoot what you were doing at the time of your disconnection. What we can do is to let you know what causes them so you can compare those to what you were doing right before it happened and know what not to do so you will stop disconnecting. 1. Picking up items. There are 3 possible issues when picking up items. The first is clicking the same type of item box twice. When you click an item box, all items of the same type will be picked up. Give the server the half a second it needs to do this for you. It is actually faster in the long run than spam clicking. The next is spam clicking. You need to allow the server the fraction of a second it needs to collect the items for you. When you spam click to pick up ALLTHEBOXES, you are not allowing the server to finish collecting “Item A” before you also tell it to collect “Item B, C, D and E”. Server gets cranky at being bullied like this. Allowing the items to stack too high before picking them up. When you allow hundreds of items to stack up before trying to collect them, the server gets cranky, much like in the spam clicking scenario. Do pick ups a little more often when farming. 2. Spamming class skills. Again, the cure here is to slow down the clicking. We have found this is more likely to happen to players who use the keyboard and classes with haste boosting skills. If you have a haste buff expiring at the same time as you use a skill, you will sometimes disconnect. This may solve itself as you level up and gain more natural haste. Another class-related method that causes crashes is by taking damage when your HP is reduced to 0 by an HP cost skill (Void Highlord) or by a reflect (Burning Ward, Temporal Insanity). Be careful of that, too. Changing to these settings, individually or all together, can reduce a significant amount of lag. Another thing you can do to reduce lag is to have less tabs open, and this is especially true when you have streaming services like video or music sites open on other tabs. 4. Spam clicking the quest turn in button. The quest turn in box, just like any other part of the game, can be affected by lag. If you click the button and the quest does not turn in normally, please do not spam click the button. It will not force the quest to turn in. It can force you off the game though. Your best option at that time would actually be to use the back or abandon buttons, give it a few moments and try to turn the quest in again. 5. Your Internet. You can have an amazingly high internet speed, and still have it drop for a fraction of a second and then come right back up. In many cases you would never even notice these types of drops. Sadly, this is enough to disconnect you from the server. 6. Your browser. With changes to how many browsers are handling Flash, you may experience load issues or connection drops with some of them. Because different browsers work better or worse with different systems, there isn’t one that we can recommend. Try multiple browsers and see which one works best for you. And finally, my favourite thing to remind you of! Always make sure you Clear Your Cache regularly. I recommend no less than once a week, and up to 3 times a week if you play daily. 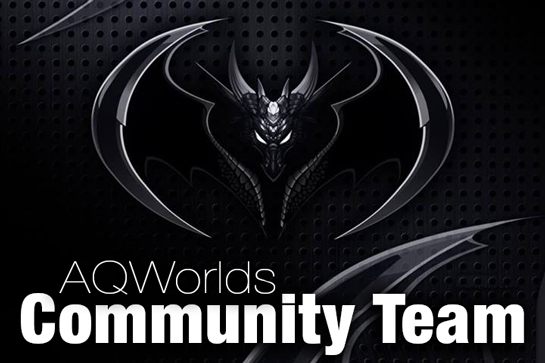 Want to join the AQW Class Tester Team? Our in-game Class Test and Balance Team is amazing... and more, they all started as members of our player community! They joined our corps of contributors* to make the game better for everyone. We're looking for some fresh new faces to bring new enthusiasm, energy, and awesomeness to the team! And that's why we're here today. What Do Class Testers Do? Class Testers / Balancers work with the Lead Class Designer and dev team, giving feedback during the design and balancing of new classes, plus helping as we re-balance existing classes to bring them up to our current power levels. We love when players ascend, and join the ranks of our community team! We offer challenges, very bad jokes, and some pretty sweet perks. Read on if you think you’re ready to apply. You must be 18 to apply and join the community team. No exceptions. Please do not include attachments. Emails with attachments will not be actioned. 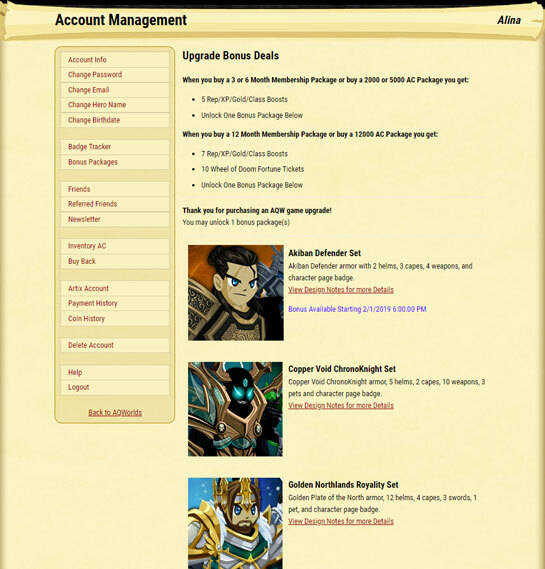 Your AQW and other AE game account histories will be reviewed, as well as your AE Master and forum accounts, if applicable. Participation in the community team is strictly voluntary, and not a paid position. All applications will be read and considered. If you are selected for consideration, we will email you. Deadline for applications is Midnight server time April 10th, 2019! Answer question 1: "why do you want to join the class tester/balance team?" Answer question 2: "what in-game stat do you think is the strongest and why? (example: attack power, hit chance, dodge)"
It will take some time for Pisces and the tester team to get through all the applications so please be patient. If we do not respond, we want to thank you for being awesome enough to apply! There are a few things we look for in all our community team members, regardless of whether you want to moderate the game, test it, fix it, build it, or polish the in-game doorknobs. Anyone meeting the criteria below is welcome to apply! * Our class testers (and all our other community team contributors) put in their time and effort to help the community and games... but we always stress that real-life obligations have to come first. That means we occasionally lose some team members to outside responsibilities... but we ALSO get to bring on MORE new team members! Chromium Void Cape and Chromium Void BattlePet added to the Chromium Void ChronoKnight shop. Carnaval 2019 LTS Shop returned to the game menu. Arch DoomKnight's Edge will now show on character pages. Links to Aria’s Pet Shop should be all updated now to new room. You’ll let me know if we missed any, right? Several item reports came in this week that were not bugs. Please remember that art is subjective, and while we do love to hear your feedback on items we release, we will not be able to make changes that are not bugs. When it is an opinion, the artist is the one who gets the final say. 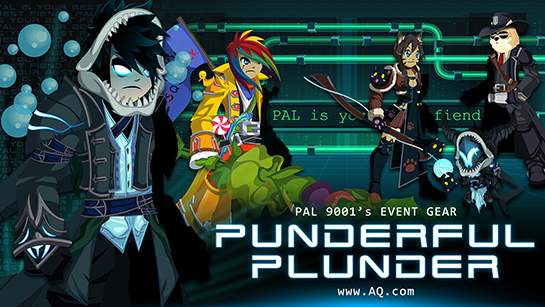 A message from the REAL Punadin, Artix Krieger: "Greetings, my friend! I am glad to C you so # today. An unknown enemy appears to have rewritten the game’s combat engine, weaponizing the humor we love most. Waves of wea-PUN-ized enemies are headed to Battleon *right now*. Why? I do not know, except they must think we are FOOLS. But we have been PUNderestimated, and I know you will stand with me as we fight back against this onslaught of PUN-ishment. We must regain control of the combat engine. This war will be short, it will be sweet, and it will be PAINFULLY PUNNY." Once the war meter hits 100%, take on the boss for its war drops.